I am currently working on completely redoing my website, so have been going back through the articles on my Resources page and thought it was a shame that they are not easily available. I wrote this article orginally back in 1999, but surprisingly, I still feel the themes are relevant today. Yes, there is more awareness of the benefits of massage and shiatsu, but there is also more medicalisation of birth. Enjoy reading it and I welcome your thoughts and comments! listed in shiatsu, originally published in Positive Health issue 41 – June 1999. You can still view the article on their website. Massage was traditionally one of the main aspects of maternity care. Midwives were often the local village healers and would give the mother weekly, or even daily massage during pregnancy. It was one of the main tools of support in labour and the immediate postnatal period for mother and baby. In our technological societies, massage has come to be seen as more of a “luxury”, both by the mother and those who care for her. Antenatal care consists more and more of screening and diagnostic tests of increasing cost and dubious effectiveness. Routine scanning, for example, has been shown to be of no benefit to either mother or baby, yet the number of scans continues to increase, supposedly due to the fact that this is what women want. The high use of technology in maternity care has been challenged, especially since the Changing Childbirth government report 1994, concluded that “a medical model of care should no longer drive the service”. There are many midwives who have done training, particularly in massage, aromatherapy and reflexology, who are integrating these therapies in their work. At some hospitals, for example, the Hope Hospital in Walsall, there are clinics, run by midwives, where women can have access to holistic therapies on the NHS. There is an increased acceptance of the benefits of home birth and a questioning of the high, and increasing levels of Caesarean section and other interventions. Many postnatal groups include sessions on baby massage. Yet, maternity services can not cope for ever with an increased demand, both for technology and complementary therapies. Holistic therapies need to “prove” their benefit. It is the purpose of this article to show the relevance of shiatsu and massage in the maternity services. It was through becoming pregnant myself in 1989, that I first became excited by the possibilities of using shiatsu and massage during the childbearing year. Now, 10 years later, I continue to be amazed at the power of these therapies, to transform the life of mother and child, and thence the immediate family, and ultimately the whole of society. Compared to technology, they are very cheap to implement, they enable a mother to have more confidence in herself and they address her emotional and spiritual needs as well as her physical ones. My first pregnancy was a magical time for me. I was aware of my daughter at conception. I had regular shiatsu and massage through the pregnancy, trained with Elizabeth Noble and attended some yoga and exercise classes. My shiatsu teacher, Sonia Moriceau, taught Chris, my partner, some shiatsu to use in labour, which he used effectively to help bring labour on after my waters had broken and for pain relief. I enjoyed giving birth at home, with no drugs or intervention, until the midwife panicked in third stage. The midwives continually undermined my confidence and I felt I was having to fight to listen to my body’s needs, even in labour. Five years later, pregnant with my son, I experienced very different attitudes. The midwives stayed in the background, as again shiatsu and massage were all I needed. I gave birth to my son, as I wanted, without the midwife guiding the baby. As I leant forward to pick him off the ground, I felt immensely powerful and fulfilled. Pregnancy and birth is a time of magical new beginnings, and the way women experience it, sets a pattern not only for their health for the rest of their lives but also that of their children. If a woman is not connected to her body and baby, she may experience a difficult pregnancy, birth and perhaps suffer from postnatal depression and have trouble bonding with her child. If a woman is connected to her body, then the chances are she will experience this time as joyous and life-enriching and be wiser and stronger for it. Even if she has difficulties, or uses technology, she will still feel empowered, rather than a victim. Shiatsu and massage are extremely powerful tools to support this process. One of the things which characterises this period, is flexibility. Pregnancy challenges the mother with its newness and its demands to adapt. It also challenges us as therapists. I am continually learning new skills and new ways of being with women. I include work with breathing, positions, meditation and visualisation as part of the way I use shiatsu and massage. I see limited benefit in releasing physical tensions through shiatsu or massage, if the woman is not guided to be more aware of her posture, and the way she uses her body each day. Movement and breathing provide useful tools for a mother to connect with her body, and baby and prepare herself and her baby for birth. I teach the mother to do some massage or shiatsu for herself in pregnancy and postnatally for the baby. I also involve the woman’s partner or friend in learning some shiatsu, massage skills and working with breathing and exercise. I developed this through working with my partner, who is a yoga teacher and homoeopath. The father can learn techniques, like back massage or shiatsu, which can help the mother to relax and ease physical tension. I often teach the father to massage the pregnant abdomen, focusing on his contact with the baby, maybe even introducing singing or visualisations. Nearer to the birth, I teach techniques for pain relief, including points which may help in more specific situations, like slow labour, or a retained placenta. Postnatally, I encourage fathers to learn baby massage – if they are able to relieve colic or help their baby sleep, they have a role, even from early on. This is a new development. In most cultures, birth was seen very much as a woman’s domain, and men would often stop having contact with the mother during the pregnancy. They rarely attended the birth and even the early postnatal period would be one from which they were excluded. Many men are able to engage with the mother and baby during this period, providing vital support for the mother and establishing a close relationship with their baby. 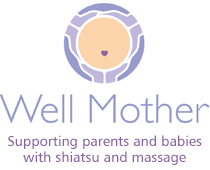 I work closely with health professionals, so that they too can be involved in supporting the mother with massage and shiatsu. I teach skills to midwives, focusing on techniques and aspects that they are practically able to use in the constraints of the NHS situation. They have contact with large numbers of pregnant women in a way that most “complementary” therapists do not have, but they usually don’t have the same amount of time. A midwife can learn to touch the abdomen in ways which incorporate relaxation for the mother and working with the energy of the baby, as well as simple back and neck techniques to relieve tension and promote relaxation, which can be incorporated into ordinary antenatal appointments. If the techniques are taught in such as way as to enable the professional to be connecting directly with each individual’s energy, the work can be extremely effective. They can use massage in labour rather than drugs and can encourage mothers and fathers to massage a new-born baby. I would like now to demonstrate through some case studies some of the benefits of this approach. A is a physiotherapist who is suffering from carpal tunnel syndrome. She has had a little shiatsu before. Work focuses on shiatsu work on Triple Heater, Kidney and Bladder meridians, with some massage work on levator scapula. I give her some exercises to do, especially ones involving raising the arms to allow the fluid to drain, and releasing levator scapula. After a couple of sessions, the symptoms have disappeared. In addition she reports that she is more relaxed, feeling more connected to her baby and more ready for the birth. N was pregnant with twins and had high blood pressure, She felt she was being bullied into having a medicalised pregnancy, and was already at 18 weeks beginning to feel anxious about the birth and beginning to suffer from lower backache. I taught her partner some techniques for relaxing her back, using a combination of sacral work, kneading and petrissage, as well as some shiatsu point based work for the pelvis and neck. We also did some massage on the abdomen. I saw them again much closer to the labour, the father was quite confident about his role and felt very connected to the babies. R is an obstetric physiotherapist who attended one of my shiatsu courses. She began to incorporate some energetic work in her practice when presented with cases of diastasis symphysis pubis (excessive laxity of the joint between the two pubic bones). She reported dramatic results. J came with her partner on one of my birth preparation days. She and her husband were both obstetricians, and a little unsure of this kind of approach. However, they wanted something that was different to the medical cases they were involved in. Afterwards they reported how amazed they were that you could press certain points and ease away the pain. They used GB21 to help in a slow second stage and were impressed by the changes it brought in the labour. The father said it was a help to have a focus on the mother and the baby in a practical way, rather than his usual focus on machines. X had had 2 previous Caesareans, the second for rather dubious reasons. She was determined to avoid another Caesarean, but met with opposition from all medical staff with whom she had contact. She asked me to support her, as she felt her partner would not be able to stand up to the opposition. I was careful to involve him through the labour in the work I did, showing him shiatsu and massage for pain relief and how to give physical support in birth positions. She gave birth kneeling, having just had gas and air to help slow labour down when she had wanted to bear down on an incompletely dilated cervix. She chose to have no syntometrine for third stage. A key element was her belief that she could give birth vaginally and a large part of my role was to support her in that belief. K began attending my classes early on in her pregnancy. She had had a previous Caesarean and did not want to have another one. We worked to make sure the baby was not posterior, as her previous baby had been. She and her partner attended one of my birth preparation days, but she wanted a little extra support during the labour and asked if I would attend. My initial contact was by phone, when her waters had broken and were lightly meconium stained, but she hadn’t gone into labour – I suggested some points for her partner to work on, SP6 and LI4 intensified the pain of the contractions, making them more regular. When I arrived she was having contractions quite close together, but not lasting very long, nor overly strong. Her partner and I worked together. She had a history of back problems and only liked gentle general pressure on the sacrum. She responded well to neck points (GB20, BL10 and GV15 and GV20) which relaxed her, easing pain in the lower back and opening the pelvis. We continued this work while she was in a bath for couple of hours, as well as working with sound. The midwife was very supportive of this whole process.7 She feel nauseous throughout and didn’t want to eat. LI4, LV3, BL60, KI3 and SP6 helped ease the nausea and kept it at bay through most of the labour. In her previous labour she vomited throughout – this time she vomited only once and this was while I was away on a break. The labour was slow, and eventually K had an epidural. We continued to work the points for nausea and the neck and did massage on the belly and some chanting. This helped the baby relax and in turn helped K relax, and realise how she needed to move to help shift her baby’s head from the transverse position, which she did with success. Eventually K was given one hour to push the baby out. The midwife, her partner and I helped her into an upright position. I used GB21 and K began to feel that she needed to tilt her pelvis to move the baby down. He was born a few contractions later – only 35 minutes after the time limit began. Half an hour later, the baby began grunting a little. The paediatrician began to feel that he may have to go into special care. K asked me to work to prevent this. I worked with the L and LI meridians especially L1 and L14 and later ST25, and CV and GV and Yu points. 7 He began to breathe a little better and the moulding on the head started to even out. Later, K’s cranial osteopath did some cranial work and the baby did not have to go to special care. S contacted me a few weeks after the birth of her baby. She had been pregnant with twins, gone into labour prematurely, and lost the first baby. The second baby girl had had a massive haemorrhage, was suffering from cerebral palsy and in the Special Care Baby Unit. S was weary of seeing her baby undergo the barrage of interventions, and lack of physical and emotional contact and was extremely stressed. I went to work in SCBU – my aim being to diagnose the work needed and then to teach it to S. The head was very swollen, and there was a lack of tone in the muscles, especially the arms and legs. My work focused on gentle stroking work, contact with BL, KI, SP and GB meridians, mobilising the arms and legs, as well as work off the body. I went to the unit on another occasion, when we were able to work a little more physically. Later S came to my postnatal exercise and baby massage classes. Now, 5 years later the child is almost blind, but has quite good tone in her limbs. The prognosis at birth was that she would not be able to walk – she is walking. S feels that massage and shiatsu enabled this and provided an opportunity for her to be more aware of her baby’s needs. It gave her a time when she was able to relax and focus on a positive aspect of her baby’s care, rather than passively awaiting results of tests and interventions. As therapists working with shiatsu or massage we need to work on many levels to ensure a continued use of them in maternity care. We need to work directly with women and their families, so that they can experience the benefits and make demands on the maternity services. We need to work with other massage and shiatsu practitioners to develop high standards of work in this field, so that we are confident in difficult situations and able to communicate with other health professionals. Furthermore, we need to establish training in massage and shiatsu for orthodox medical practitioners so that they too, become convinced of the benefits. As more people work in this field, large scale research projects can be carried out, so that the benefits can be quantified more than remaining anecdotal, which provides a stronger case for their importance as part of the future of maternity care. 3 Editors D. Tiran and S. Mack, Complementary therapies in midwifery practice, Bailliere Tindall, 1994. 5 Elizabeth Noble, Essential Exercises for the Child-bearing year. Houghton Mifflin,1982. 6 Wataru Ohashi with Mary Hoover, Natural Childbirth the Eastern Way – A Healthy Pregnancy and Delivery through Shiatsu, Ballantine, date 1983. Wataru Ohashi with Mary Hoover, Touch for Love – Shiatsu for your baby, Ballantine, date 1985. Giovanni Maciocia, Obstetrics and Gynaecology in Chinese Medicine, Churchill Livingstone, 1998. 7 Suzanne Yates, Well Mother Exercise and Massage video series, Mark-it- TV. First two videos released 1999. 8 Suzanne Yates, Supporting women with Shiatsu, MIDIRS digest December 1998, vol 8, no 4 pp 422-424.